Today I would like to share another one of my treasures with you. I love this piece of furniture. I bought it, or I should say I 'won' it on eBay just before we returned back to Canada. It was my present to myself to bring back home with me. You have no idea how worried I was that I wasn't going to win the bidding on it!! And when I did ~ I was over the moon. ... my Victorian bank of drawers! It is from around 1880 and it is big ~ over 5 1/2 feet long and just over 4 feet tall. It weighs a ton ~ really it is so heavy and it has ... 45 drawers!! When I bought it, it was standing in a steel factory in Sheffield, England and it was really messed up. Covered in grease and oil and it had no back. It was embedded with thousands of metal splinters and somebody had cut two pieces out of the top of it for fit some where ~ I had my work made out for me! I stripped it by hand with almost no sanding at all. I gave it a new back and fix the top and it took me over 3 months to get it to look like it does now and I did it all in our garden shed in the UK ~ every day a little bit and it was so worth it, don't you think? Now it stands in my living room and every time I look at it and I have had this for almost 8 years now, I still smile because I can't believe it's mine! This is a piece of antique furniture I used to dream of owning - a beautiful piece of history like this and now I do. I alway wonder where it used to stand when it was made, what was it used for? Unfortunatly I don't have any answers. It is lovely to have treasures in your life. It doesn't have to be anything big like my cupboard it could be the smallest thing like a little drawing or note from you son or daughter or maybe a stone they found and gave you or something simple as a memory ~ no matter what it is be thankful for it, love it and cherish it. today I would like to share the end result of my newest design. I made this little creation just in time for Spring and for upcoming Easter as well. I decided to made it from a beautiful brown colored velvet and then I also decided, just like with my little mice, to give this little wee rabbit a name ~ I named her 'Blossom' ~ you will find out why I picked this name a bit further down in my post. Again I took many pictures for you so can see this cute little creature properly. ... and not only a tail but also a name. She fits perfectly in one of my spring nests I had made and it looks like she is very happy there. Isn't she just too cute?! I could just imagine her opening her little eyes after a long sleep in the spring sun ... so sweet! I hope you have enjoyed my newest creation ~ I loved making her. These are my giveaway goodies! Sweet Karen, please drop me a line via e-mail with your mailing address so I can get these goodies on their way to you! Why not 'hop' back tomorrow to see my new little critter. since Spring is hopefully just around the corner I wanted to design something that just shouts out springtime and that for me is a little wee baby rabbit. Once I have an idea I tend to sit down and work on it until I am happy with it and it is just right in my eyes and it was the same with this design. I started two days ago and made more than one pattern and I did sew each of the patterns and all that by hand. Even though I have slightly sore finger tips again I do love sewing by hand so much. I do have a sewing machine but I only like to use it for big things like curtains or soft furnishings like pillows. Even when I make king sized quilts I sew them completely by hand and love every moment doing so. Oops I got side tracked and now back to my new design ... as I said I started 2 days ago and now I am finally finished with it. I love that it has the same cute look like my little cupboard mice. Now I just have to sit down and sew the actual final creation. It all starts with one little idea and a sketch and then I just have to get it right by trail and error ..
... and if that means making a few or more, then that is what it takes. I tried out a few different fabrics such as linen, velvet and muslin so far to see which would look the best and I might try a few more even. Once I am completely happy with the little critter I will share the result with you, hopefully in the next day or so. So ... keep 'hopping' by to see if the wee rabbit is ready. this is going to only be a short post today. I am asking the person 'Hope Amen' who had entered and won my giveaway on February 13th to please get in touch with me via e-mail with her mailing details. So far I haven't heard from the winner yet so I have decided to wait until Friday, February 24th and if by midnight I haven't heard from Hope Amen, I am going to draw a new winner for my giveaway. I still have all the names that were put into my hat tin ~ so no need to worry about entering your name again but it also means no new entries please! Of course I will let you all know what has happened as soon as I know. So, dear 'Hope Amen' please drop me a line very quickly!! I hope you are all well and life is treating you kind. I bought myself some new rubber gloves ~ one left hand and a right hand ~ and I got to do my felting at last. I can now finally share my new felted nests with you. I have had so much fun making these and this time I made them spring time nests. I used many new types and colors of wool to give the effect of fresh moss, dried little twiglets and spring time colors. And this time I added a new little idea and twist to the nests which I came up with while I was working on them. ... little book page leaves!! I wasn't too sure about the shade of green I chose for the leaves so I made some more but without the color wash and I liked them if not just as much as the green ones, maybe even more. I not only got carried away taking many photos again but I also got carried away in making many nests as you will see and ... I still have 4 more on my worktable right now waiting to be finished! Combined the felted nest and paper leaves make these lovely creations! ... just be waiting for some little bird to come and call it home. ... some with green leaves ..
... but each one just as pretty as the other never the less! I hope you have enjoyed my newest creation today. You can still find my felted nest tutorial on the right side of my blog under my free tutorials if you wish to try it for yourself. I hope you are well and life is treating your kind. I am always on the look out for new things to create with and I was very happy to find a few whilst shopping at our famers market this past weekend and it was nice to get out and take the drive there which we only do about 6 times a year I think. I am not sure what I am going to do with my new findings but I am hoping I will come up with an idea sooner or later. ... some old tap handles. I think they would make great bases for something to stand on! And all of this for the low cost of under ten dollars!Like I said, I love finding neat little treasures to take home with me - it is always so much fun unpacking them and thinking of all their possibilities. This is just a short post for today because I'm now going to make a nice warm cup of coffee, grab my wee notebook, and start sketching some new creations that I can make with my new findings. I didn't get a few of my house chores done last weekend. The window cleaning didn't happen due to snow and more snow so it will have to wait until another warmer day ~ it actually snowed all weekend here so I ended up snow blowing ours and a few of our neighbours driveways and paths which was quite some fun actually! I did work on a few things that were on my worktable though. I hope you saw my Valentine's Day gifts for my daughters. That was my main project that needed to be finished the past weekend but I also worked and still am working on some other creations. One of them was some new felted nests. Since there was snow still falling outside I tried to create a bit of spring inside in the form of spring nests. Again I was going to do the felting by hand in my sink but I am thinking of trying to do it in the wash machine the next time maybe. The worst thing was when I wanted to start that I could only find left hand rubber gloves!! I have no idea what happened there but it was going to be a bit awkward trying to felt wearing a glove that didn't fit right so I didn't continue with it. So ... now I need to put 'rubber gloves' onto my next shopping list. I can't believe myself ~ I am already thinking about new creations for this next Winter/Christmas!! I think it must be the weather doing this to me ~ all this snow outside! I will have to make sure I don't get carried away and start anything new, even though I can see myself losing that battle and maybe making one little one of the wintry pieces ~ you see I am weak sometimes when it comes to any new ideas! I have used a lot of new types of wool for my spring nests and they look really good already and they're not even felted yet! I wonder if you might guess what these are going to be once they are finished. I also found two new products, well they are new to me and it was exactly what I was looking for to use in other creations of mine. The one is 'Dimentional Magic' from Modge Podge and the other is called 'Crackle Accents' from Inkssentials and right now I am experimenting with them on one or two ideas I have had. I will share more with you once I have finished my creations. ... Mom, Dad, Daughter and Son beads!! They are going to be turned into more of my 'neat pins' when I get a moment to make them. I absolutely love to create and I hope you can tell by what you see here at Todolwen. I think that's why I tend to work on more than one project at a time ~ it's like one project isn't enough for me most of the time. I love popping from here to there and back again and then suddenly you are done ... what a great feeling to see your creations complete and finished. Love, love, love that feeling and I am sure all of you do as well. I would love to share my gifts with you today that I received from my daughters for Valentine's Day. There were beautiful little trinkets, yummy bits and many heart touching words. ... but because I am so worried to lose it, Drag Along will keep it safe for me! ... I just picked a letter for you randomly. Isn't it so lovely?! I also received an new ID card from her ~ she made every one in the family one of these neat things. Look at these yummy cupcakes!! 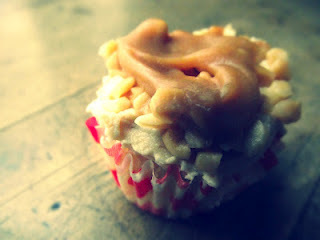 If you love peanut butter you need to go to Ashleigh's blog and read up on the recipe for them ~ they are sooo good!!! That's all for today my dear friends. I am working hard on some new creations right now. Hopefully I will have something new to share with you tomorrow. So, please pop by and take a look!